RCD Seals in excellent condition after 200 hours at 100 rpm and 2,300 psi - Kalsi Engineering, Inc. 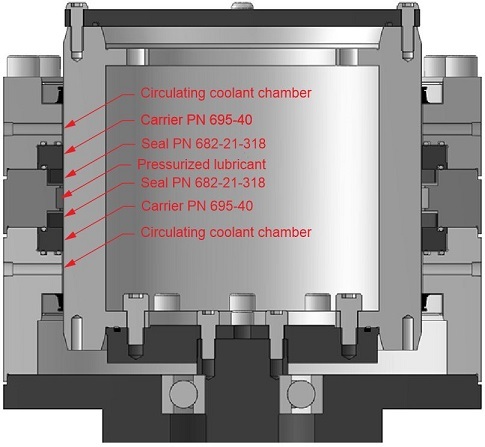 Although testing RCD seals is an expensive proposition, we test various seal designs across a range of operating conditions and hardware configurations. This allows us to confirm the performance of our existing RCD seal product line. It also allows us to evaluate and improve experimental seal and hardware designs before offering them for sale. This unique commitment to full-scale testing of RCD seals is directed at helping our customers meet their high-pressure rotary control device (RCD) sealing goals. This blog describes the latest of four tests of plastic lined Kalsi Seals: Test VF 25. The four tests included extended operation at 100 RPM on a 10.49” (266.4mm) shaft with 2,300 psi (15.86 MPa) lubricant pressure. This simulates a lubricant overpressure type RCD operating with 2,000 psi (13.79 MPa) wellbore pressure and 300 psi (2.07 MPa) lubricant overpressure. The tests were conducted with conventional non-floating seal carriers that define a 0.010” (0.25mm) nominal radial extrusion gap clearance with respect to the rotating shaft. At 2,300 psi, each test reached the 100-hour minimum and 200-hour maximum test duration specified in API 16 RCD. Although any rotary shaft seal does better with our patented floating backup ring, this test series shows that our plastic lined RCD seals provide industry-leading pressure and speed capacity when used with conventional carriers and relatively large extrusion gaps. The test fixture used for test VF 25 is illustrated below. The fixture subjects a pair of rotary seals to the conditions experienced by pressure-retaining RCD seals. 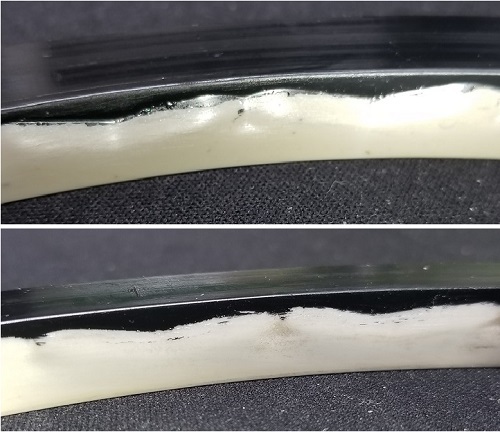 A pressurized ISO 220 viscosity grade lubricant was located between the seals, simulating the pressurized bearing lubricant of an RCD. The lubricant viscosity was selected based on its suitability for the heavily loaded bearings of an RCD. Outboard of each RCD seal, an oil-based coolant was circulated through an annular cooling chamber at less than 2 gpm. This is less cooling than that provided by RCDs that circulate bearing lubricant for cooling purposes, but a little more than what occurs because of the lower end of an RCD mandrel being exposed to circulating drilling fluid. As stated previously, both non-floating seal carriers define a 0.010” (0.25mm) nominal radial extrusion gap clearance with respect to the rotating shaft. The shaft runout was 0.007” at the upper seal location and 0.003” at the lower seal location. The PN 682-21-318 rotary seals are direct compression seals that incorporate an extrusion resistant plastic liner. This liner is forced against the shaft by radial compression of the elastomeric seal body. The liner incorporates our patented Type A enhanced lubrication wave pattern, which pumps enough lubricant into the dynamic sealing interface between the shaft and the plastic liner to generate hydroplaning. This hydroplaning action dramatically reduces adhesive wear by eliminating almost all direct rubbing between the shaft and the seal. This also dramatically reduces seal friction and seal-generated heat, which allows the plastic liner to retain maximum strength — and therefore maximum extrusion resistance. During rotation, the hydroplaning action produces a positive lubricant leak rate that decreases as pressure and temperature increase. In the absence of rotation, the hydroplaning action and associated leak rate cease. The 2,300 psi (15.86 MPa) operating condition was the final stage of the high-pressure seal test VF 25. During this stage, the shaft was rotated at 100 rpm. Cooling fluid was circulated outboard of the rotary seals. No circulation was present between the rotary seals. The hydrodynamic pumping related leak rate during the 2,300 psi (15.86 MPa) portion of the test was 16 ml/hour per seal. After 200 hours of rotating at 2,300 psi, the test was intentionally stopped. The used upper and lower RCD seals were in nearly new condition after the test. The RCD seals were also tested at lower pressures to characterize the effect of pressure on leak rate. This testing was conducted before the 2,300 psi portion of the test. At 1,000 psi (16.9 MPa,) the leak rate per seal was 91.5 ml/hour, and at 1,500 psi (10.34 MPa), the leak rate per seal was 58.7 ml/hr. All four tests indicate that a lubricant overpressure type of RCD using our unique high-pressure seal installed in a simple groove can reliably operate at 100 rpm with a wellbore pressure of 2,000 psi (13.79 MPa) and moderate cooling. Comparing the used seal condition from test VF 25 to the other three tests suggests that our -318 material combination is more capable than the -303 material combination for high pressure RCD applications. For additional information about our extremely capable high pressure RCD seals, or other high pressure sealing challenges, call 281-240-6500, or contact us by e-mail. In RCD seal test VF 25, the pressurized lubricant was retained by a pair of high pressure rotary seals, and the seals were cooled by a slowly circulated outboard coolant. At the conclusion of test VF 25, after 260 hours of operation including 200 hours at 2,300 psi and 100 rpm, the rotary seals were still in excellent condition.